Hi all just in case you didn’t know today is the first day of National Blog Posting Month (NaBloPoMo) and I decided to take up the challenge by posting my thoughts on a few novellas. You can read about my challenge here and see the books I’ll be reading throughout 30 days. So on to the challenge. Enjoy and I hope you’ll share thoughts, too or I’ve inspired you to read it. This is not my first tango with Richard Bach’s Jonathan Livingston Seagull. The very first time I read it was as part of my summer reading that my mother gave me. I devoured it fairly quickly, but I do believe the overall theme was lost on my 8-year-old mind. Even so, it’s a book I’ve come back to time and time again. And now some three plus decades later, I think I finally have a handle on Jonathan Livingston Seagull. To the real Jonathan Seagull, who lives within us all. 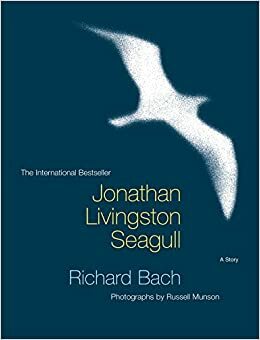 When I first read Jonathan Livingston Seagull all those years ago, I loved how he persisted in trying to soar to new heights. Dangerous heights. Deadly heights. The opening line of the novella is all about how deep within us how we really want to soar to new heights and not be satisfied with status quo or mindlessly following the “flock”. The novella has three parts. In Part One we find Jonathan not content on fighting for scraps of food and seeking to learn to soar to higher heights and his exile from the gull community. In Part Two the reader sees Jonathan transcend to higher heights and learn how to fly. In Part Three we see Jonathan return to flock to teach other gulls how to fly. Over the years I’ve read lots of reviews of this book and there are many folks that say book is very simple and naïve in its world view. And to that I say the novella is simple and I believe that we make things much more complicated than what needs to be. The simple truth is that our destiny, our path is already written and we tend to complicate it by following what others expect of us. “Your whole body, from wingtip to wingtip,” Jonathan would say, other times, “is nothing more than your thought itself, in a form you can see. Break the chains of your thought, and you break the chains of your body, too. Thanks Rara, that is one of my favorite quotes from the book. I’m going to try and make it through, but I’m feeling overwhelmed already. I think I’m going to have to change my strategy a bit. Hi Haddon, it’s a great book. There is so much to tale in hand it seems that whenever I read it I come away with something else.